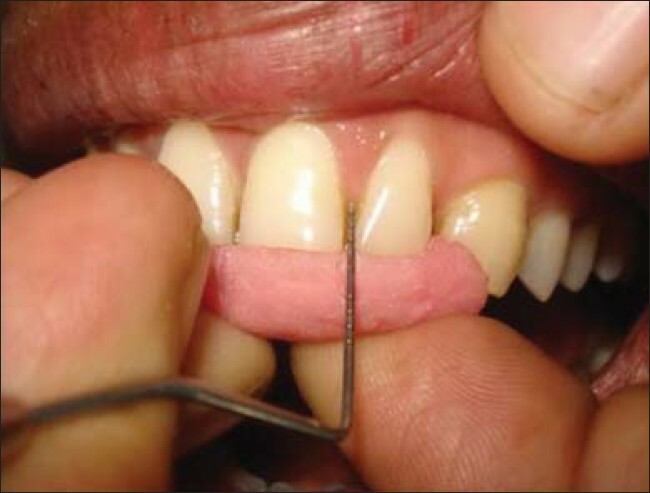 Open interdental spaces (OIS) caused by papillary gingival recession are one of the most common problems faced in dentistry. Causes include divergent roots, diastema, abnormal crown form, loss of gingival or periodontal structures. OIS usually cause esthetic and phonetic problems, food impaction etc. , In periodontics various surgical and nonsurgical treatment options have been tried for papillary regeneration. ,,,,, Surgical approaches include various flap designs and grafting techniques to augment hard or soft tissues. Limited blood supply and accesses to plaque in this region increase the chances of failure of surgical techniques. Also most of the surgical techniques provide no evidence of predictability and long-term stability. Tissue engineering techniques are being worked on in almost all medical departments for the sole purpose of regeneration. 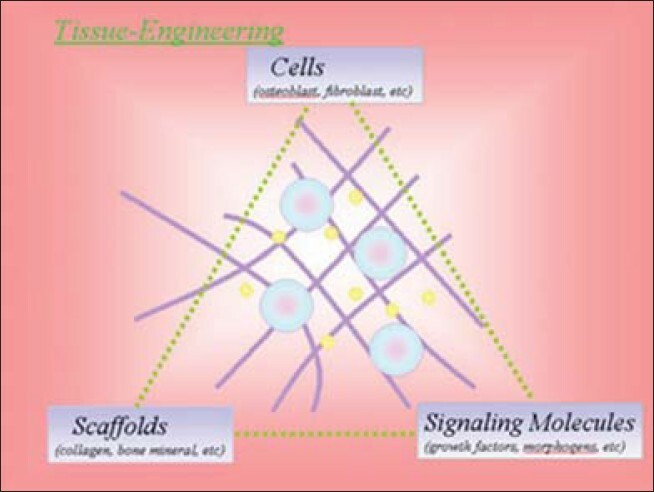 The basic ingredients for successful tissue regeneration include components of the tissue engineering triad, which include the cells which will create a new tissue, the scaffold (collagen, bone, mineral etc.) which will hold the cells in place and signals (growth factors, morphogens) which will instruct the cells to form the tissue of desired type  [Figure 1]. Here a case in which tissue engineered fibroblast cells have been used for the purpose of regeneration on lost interdental papillary height. A 24-year-old male reported to the Postgraduate Department of Periodontology, C.S.M.S.S. Dental College, Aurangabad, with the complaint of an unesthetic black triangle between maxillary left central and lateral incisor [Figure 2]. He also complained of food lodgment in the same region. On examination Tarnow's class I papillary recession was noted between 21 and 22. On the first day the patient underwent oral prophylaxis and a pair of alginate impressions were recorded. An acrylic stent was prepared over the incisal edges of 21 and 22 for standardization of measurements. The distance between the tip of papilla (P) and a fixed point on the stent (S) PS 1 was measured to be 5 mm with William's graduated probe at baseline [Figure 3]. 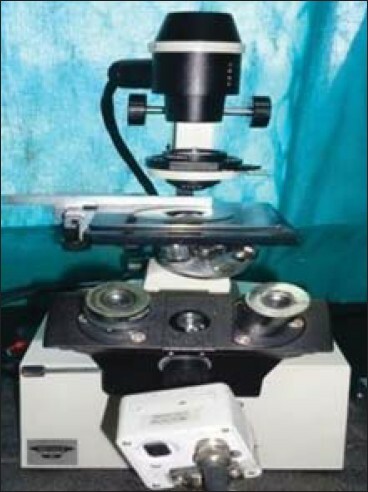 After the growth of a sufficient number of cells seen under the phase-contrast microscope [Figure 4] and counting them on a hemocytometer (≥10 6 cells/ml), cells from the medium were removed and washed by centrifugation and a cell suspension was created [Figure 5]. 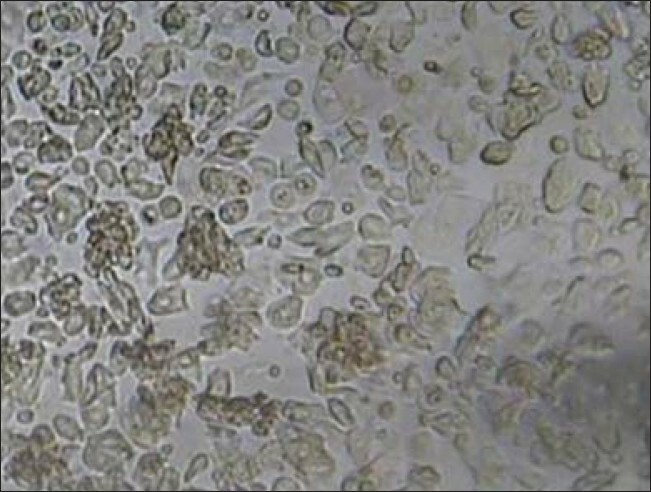 The growth of a sufficient number of cells required 5 days. The cell suspension created was transferred to the clinic in a glass vial containing sterile phosphate buffered saline. On the fifth day after PPP or after gingival biopsy culture, 0.3-0.4 ml of the suspension was injected into the selected papilla from the labial side with a syringe attached with a 30-gauge needle. The second set of injections was given in a similar manner into the palatal side of the papilla on the 10 th day after PPP or gingival biopsy. Excessive pressure during injection was avoided as it carries a risk of tissue ischemia. Subsequent clinical measurements were recorded on the 15 th day, 1 month and 2 months after the first set of injections. At baseline the distance between the tip of the papilla and the fixed point on the stent PS 1 was 5 mm. On the 15th day of the first set of injections the distance (PS 2 ) reduced to 4.5 mm [Figure 6]. At 1 month after the first injection the distance (PS 3 ) further reduced to 3.5 mm [Figure 7]. Finally complete fill of the black triangle, i.e., growth of the papilla till the base of the contact point was seen at the end of 8 weeks [Figure 8]. The distance at the end of 8 weeks/at 2 months from the fixed point on the stent to the tip of the papilla (PS 3 ) was measured to be 3 mm. [Table 1]. At the end of 8 weeks a 2 mm gain in the papillary gingival height was achieved through two subsequent injections of a suspension of autologous cultured and expanded fibroblasts. This gain completely filled the black triangle. Studies suggest that traditional surgical techniques for papilla regeneration require multiple repetitions to obtain optimal results, which tend to cause patient incompliance and inconvenience. ,, Also these techniques report to be technique sensitive and cost the patient with respect to time and money. In contrast the autologous fibroblast injection technique requires negligible surgical innervations for initial tissue harvest and provides long-term results without the need for additional harvest. The technique presented above is relatively painless. Fibroblasts extracted from the gingival biopsy were reimplanted by injections back into the receded papilla to expand the papillary tissue by the production of the patient's own collagen fibers. Any clinician who administers local anesthesia encounters difficulty in inserting much volume into the papilla because of its dense and tightly bound connective tissue, so even injection of an adequate volume of cell suspension to reach therapeutic concentration into the papilla is difficult. Practitioners also know that surgically manipulated papilla are swollen 7-10 days postoperatively and gradually return to preoperative dimensions by 1 month. Insertion of optimum amount of cell suspension could be capitalized on this edematous increase in tissue volume. This concept lays the basis for the papilla priming procedure. In the above phase complete fill of the black triangle by regeneration of papilla was seen at the end of 2 months. The regeneration effect on the papilla became obvious at around 15 days after the first fibroblast injection. If this effect is not seen a third injection of the cell suspension may be tried 7-8 days after the second injection. Reports are present suggesting that the regenerated papilla tend reaching their original position 6-7 months following the initial treatment. , Further follow-up in needed to evaluate the long-term results. Autologous cultured fibroblast injections are an efficient and safe treatment option for regeneration of lost interdental papillary height. 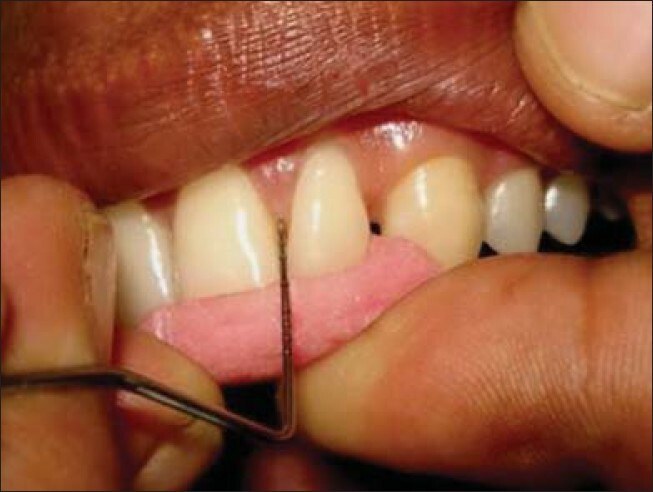 This technique is better acceptable by patients and complications associated with surgical techniques to regenerate interdental papilla are avoided. The cultured substitute is immune stable but inflammatory response may be seen. 1. McGuire MK. Periodontal plastic surgery. Dent Clin North Am 1998;42:411-65. 2. Han TJ, Takei HH. Progress in gingival papilla reconstruction. Periodontol 2000 1996;11:65-8. 3. Blatz MB, Hurzeler MB, Strub JR. Reconstruction of the lost interproximal papilla - Presentation of surgical and non-surgical approaches. Int J Periodontics Restorative Dent 1999;19:395-406. 4. Zachrisson BU. 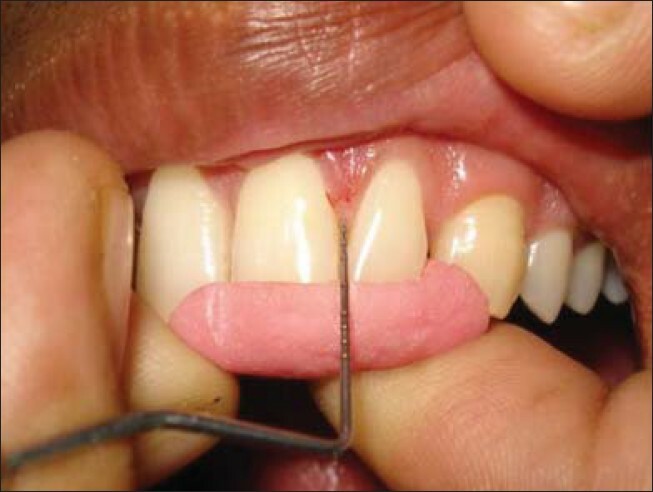 Interdental papilla reconstruction in adult orthodontics. World J Orthod 2004;5:67-73. 5. Cardaropoli D, Re S, Corrente G, Abundo R. Reconstruction of the maxillary midline papilla following a combined orthodontic-periodontic treatment in adult periodontal patients. J Clin Periodontol 2004;31:79-84. 6. Shapiro A. Regeneration of interdental papilla using periodic curettage. Int J Periodontics Restorative Dent 1985;5:26-33. 7. Azzi R, Etienne D, Carranza F. Surgical reconstruction of the interdental papilla. Int J Periodontics Restorative Dent 1998;18:466-73. 8. Azzi R, Takei HH, Etienne D, Carranza F. Root coverage and papilla reconstruction using autogenous osseous and connective tissue grafts. Int J Periodontics Restorative Dent 2001;21:141-7. 9. Lanza RP, Langer L. Text book from Lanza and Langer, tissue engineering and transplant medicine. 2 nd ed. Worcester Massachusetts. 10. West TB, Alster TS. Autologous human collagen and dermal fibroblasts for soft tissue augmentation. Dermatol Surg 1998;24:510-2. 11. Watson D, Keller GS, Lacombe V. Autologous fibroblasts for treatment of facial rhytids and dermal depressions. Arch Facial Plast Surg 1999;1:165-70. 12. McGuire, Martha E. Evaluation of safety and efficacy of periodontal applications of a living human fibroblast derived dermal substitute. J Periodontol 2005;76:867-80. 13. Yamada K, Yamaura J, Katoh M, Hata K, Okuda K, Yoshie H. Fabrication of cultured oral gingiva by tissue engineering techniques without materials of amimal origin. J Periodontol 2006;77:672-7. 14. McCullouch CA, Bordin S. Role of fibroblasts in subpopulations in periodontal physiology and pathology. J Periodontal Res 1991;26:144-54. 15. Otsuka K, Pitaru S, Overall CM, Aubin JE, Sodek J. Biochemical comparison of fibroblast populations from different periodontal tissues: Characterization of matrix protein and collagenolytic enzyme synthesis. Biochem Cell Biol 1988;66:167-76. 16. Nordland WP, Tarnow DP. A classification system for loss of papillary height. J Periodontol 1998;69:1124-6. 17. Melcher AH. Healing of wounds in the periodontium. In: Melcher HA, Bowen WH, editors. Biology of the Periodontium. London: Academic Press; 1969. p. 497-529. 18. Clark DP, Hanke CW, Swanson NA. Dermal implants: Safety of products injected for soft tissue augmentation. J Am Acad Dermatol 1989;21:992-8. 19. DeVore DP, Kelman CD, Fagien S, Casion P. Autologen: autologous, injectable dermal collagen. In: Bosnick S, ed. Principles and Practices of Ophthalmic Plastic and Reconstructive Surgery. Philadelphia: W.B. Saunders; 1996. p. 670-5. 20. Jhaveri HM, Chavan MS, Tomar GB, Deshmukh VL, Wani MR, Miller PD Jr. Acellular Dermal Matrix Seeded With Autologous Gingival Fibroblasts for the Treatment of Gingival Recession: A Proof-of-Concept Study. J Periodontol 2010;81:616-25. 21. Clark RA. Wound repair. Overview and general considerations. In: Clark RA, ediotr. The Molecular and Cellular Biology of Wound Repair. 2 nd ed. New York: Plenum Press; 1996. p.3-50. 22. McGuire MK, Scheyer ET. A Randomized, Double-Blind, Placebo-Controlled Study to Determine the Safety and Efficacy of Cultured and Expanded Autologous Fibroblast Injections for the Treatment of Interdental Papillary Insufficiency Associated With the Papilla Priming Procedure. J Periodontol 2007;78:4-17. 23. Boss WK, Usal H, Fodor PB, Chernoff G. Autologous cultured fibroblasts. A protein repair system. Ann Plast Surg 2000;44:536-42.